Wayne joined our firm for an educational session on LinkedIn and his insights were invaluable. He did a great job of tailoring his presentation to our unique compliance restrictions and industry considerations. His engaging style managed to captivate a traditionally restless crowd. I would recommend Wayne to any firm seeking to take greater advantage of LinkedIn to help grow their business! On behalf of the ICSC CenterBuild Program Planning Committee, we couldn’t have been more pleased with Wayne’s participation in the 2013 CenterBuild Conference. His two (2) repeat workshop sessions were the highest attended sessions; 160 in one and 180 in another. We have received excellent feedback and anticipate even more to come. Thanks Wayne! I believe that you made more LinkedIn believers! Amy J. Murdock, PE; 2013 CenterBuild Workshop Subcommittee Chair and Principal Code Consultants Inc.
Wayne spoke to my Vistage group of CEO's in Austin, TX. This was his first engagement with a Vistage group and he far exceeded any expectation. His presentation was practical and applicable to the CEO's and other guests. He is personally engaging and very "real" in how he addresses the audience. The information that he shares is not the usual preprogrammed presentation but an actual view of how to use LinkedIn. He adjusts to questions and comments immediately and does not miss a beat. 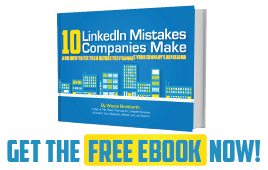 Wayne Breitbarth is an absolute home run speaker / trainer for any audience seeking a LinkedIn expert. His engaging presentation style helps people quickly learn how to use LinkedIn to grow sales, brand their company and help others. He led three sessions covering three different topics. All our survey feedback rated him excellent for presentation, content and value. We cannot wait to bring him back again. Our clients *loved* this and are already working his tips to their best advantage. Wayne was a featured speaker at Marquette University's fifth annual PR & Social Media Summit and did a fantastic job. He blends enthusiasm and deep expertise -- a great formula for a successful session. Just listen to Wayne speak -- you can't help but feel his energy. As a committee member for planning the Electronic Representatives Association's convention, I was assigned the task of helping find someone who could present what a powerful tool Linkedin can be for the association's members. Wayne was just the person that we were looking for. His energy was intoxicating, and his knowledge of LinkedIn's capabilities as they related to our business was the perfect fit. I am anxious to get Wayne to share this same message at our regional chapter level soon. Greg Nemchick, President and CEO at WorkPlace Furnishings, Inc.
Wayne is not only a great speaker, he also has extreme knowledge of his subject matter. The audience is riveted to their seats while absorbing the relevant information in a fun and easily understood format. We have had Wayne perform break out sessions two years in a row at our annual conference and the survey responses rate him as one of our best speakers each of those years. His book The Power Formula for LinkedIn Success is pure gold and the first gift I give to each of our new members consistently. I use Wayne's strategies on my own personal page and we are following his advice on our business page that is currently in development. I highly recommend Wayne and assure you that hiring him to speak for your organization is money well spent. Wayne spoke to the Executive Resource Group about Linked In and absolutely knocked it out of the park! His energy is contagious, and his enthusiasm for Linked In is unmatched. Wayne builds rapport so quickly with his audience, and he delivers valuable content in a very engaging way. Our one-hour session went by so quickly, with all members wanting more time with Wayne's insights. I give my highest possible recommendation for commissioning Wayne as a speaker for your event. Wayne is enthusiastic, engaging, interesting and (of course) highly knowledgable in his subject matter. He does his homework about his audience to tailer his talk directly for who he's speaking to, and makes his points memorable through relevant storytelling. You can't go wrong working with Wayne. Wayne presented The Power Formula for LinkedIn Success-Special Nonprofit Edition. It was excellent and was attended by over 50 people. Wayne's enthusiasm for the power of social networking, his real world business experience, his skill as a presenter, his mastery of LinkedIn, and his nonprofit volunteer experience combined to make the session a real hit with the people who attended. It was so well received that the word has spread. We're already planning to do another session later this year.